Dr. Bill Boissonnault has published numerous articles related to patient direct access to physical therapist services model, consulted with more than 70 hospitals and clinics regarding implementation of the direct access model, and served on the Wisconsin Physical Therapy Association’s task force for promoting the adoption of the direct access model. Dr. Boissonnt is the Executive Vice President of Professional Affairs for the American Physical Therapy Association. Bill, welcome to the Healing Pain Podcast. It’s great to have you on today. Thanks. It’s great to be here. Thanks for inviting me. We’ll be discussing the growing interest in primary care and physical therapy and of course, the importance of direct access. As a profession, we’re working on both in various ways. I think we should start with direct access first. I’ve been practicing since 1996. Back then, direct access was really just starting. I think only maybe one or two states had it. Now, most states have it, although, there are still states out there like Texas that struggle. Can you start out first by explaining to us the current state of direct access physical therapy in the United States? Actually, it has a long history. Nebraska was the first state officially that had it on the books for direct access. That was 1957, so we’ve been predating the military model. Most people equate direct access and the physician extender role with the military. That certainly is where it is best developed, but there are some states that PTs have had the ability prior to the military model. Actually, as of 2014, all states now have evaluate and treat to some degree. Although as you alluded to, there are some states that have significant restrictions or limitations built into the language, but all states. Of the 53 jurisdictions, and focusing more on the states in the District of Columbia, only eighteen have unrestricted full direct access, meaning no limitations, no restrictions of any sort. There are a number that have significant restrictions. I think we can say that we have it in all 50 states and District of Columbia to some degree, but we still have a lot of work to do legislatively. Do we know which states are struggling the most still? Most people equate direct access and the physician extender role with the military. The states that have significant restrictions, Texas is one example, Michigan, Illinois are other states that have significant limitations to what physical therapists can do within that practice model. As with other states, I know Wisconsin, the one I’m most familiar with, the law was originally passed in ’87 and then it was updated twice since then. Every five, eight years you go back and you try to eliminate some of the limitations or restrictions that were part of negotiations to get something off the books. The states that are facing lots of limitations, most of the states have gone through that process as well. Michigan was the most recent one in 2014. They were the last state to get something in the books related to and incorporated treatment to a degree. When you talk about negotiating, every year these states will go back and negotiate. For instance, in New York state where I live, we can see a patient for 30 days or ten visits, whichever comes first. It’s been a wonderful thing in the state. I still think I’d love to see that drawn out more. Maybe I think three months might be more appropriate considering some of the patients we have have chronic disease and a month or ten visits is not long enough. In those states, who are we negotiating with? I know obviously, that varies from state to state, but what types of organizations or interest groups are we negotiating with to say, “We have a role. By having direct access, we can improve the quality of Americans’ health.”? The other organizations, political organizations, are state medical societies that are influenced by AMA policy and procedures. Chiropractic associations, and there’s more than one national chiropractic organization. Health insurers or health alliances, I know again in the state of Wisconsin we just modified in Wisconsin the state practice act, it was health insurers, Wisconsin Hospital Association. Besides the classic or traditional medical and chiropractic association, those are other groups as well. If we have some literature, some evidence-based data that direct access to a physical therapist improves the quality of care and helps cause containment, I guess my first question would be, why would an insurance company not like to see this broaden throughout the states? We can always use more evidence, more data, but we do have evidence and data going back to the ‘70s in the military model. It doesn’t seem to be any negative associated with this model. We have no chance these days. But all the evidence and a rule doesn’t guarantee success in the legislative process. It’s control. It’s power. From an insurer’s perspective, what they’re worried about is increased cost. Actually, I’ve seen some data published where there are increased costs associated with physical therapy services that are being provided, but the hope would be that they don’t just look at physical therapy associated costs, costs within the entire service line. 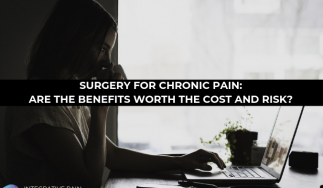 Back pain, for example, there are some models that are implemented so there’s been an increase in the physical therapy associated costs, or overall decrease in costs related to managing patient with low back pain. That’s one of the reasons we try to educate insurers is, “Yes, it could be the costs associated with physical therapy services may go up, but overall costs will go down.” It’s a challenge. I want to wrap up our direct access conversation and move toward primary care. But before we wrap up direct access, in the states where physical therapists are trying to see direct access broaden, what kind of license physical therapist do or someone that supports our profession due to help direct access move forward in those states? A couple of things before we shift over to primary care. What physical therapists can do is, it’s somewhat ironic that some things had direct access for a long time, but is it really being implemented in day to day practice? Anecdotally, like yourself, I’ve heard from some private practitioners that 50% of their case load or more comes in via the direct access model. There are four studies that have been published that I’m aware of, surveys, these isolated to states. There was a study published in Wisconsin, a study published in Ohio, but there were studies going back in 1992, then 1998 and then 2012 and 2016 looking at to what degree of implementation. In these studies, it’s less than 10% of the patients accessing our services are coming via the direct access route. The Wisconsin data for example, even though Wisconsin had direct access since ’87, there’s a separate set of rules and regulations for hospital practices, hospital based practices, which is what I was in. This is one of the barriers to implementation. There’s an extra step. It either requires a hospital bylaw change or internal policy change above and beyond what happened at the level of the law. In Wisconsin and many other states, there is an administrative code for hospital practice. They are guided by CMS language. There is that extra step. Some of these, I know some private practices that have an internal policy, we don’t do direct access even though it’s allowed by law. Hopefully, those change. We need to get rid of those policies. I understand about concerns related to referral sources becoming upset. One of the things that I’ve seen in my experiences with hospitals and the survey I did in Wisconsin is that there are some physical therapists that don’t want to do direct access. Comfort level is to try to develop a model or a program to make sure that the PTs are confident and comfortable. Comfort level, confidence or whatever it is, is to try to develop a model or a program to make sure that the PTs are confident and comfortable. If they’re not, we don’t want them involved in this model because we don’t want this model to go haywire in that regard. It’s advocating within the company you work, within the hospital you work at, the private practice that you’re working in and advocating for, “They’re not incorporating that model. Let’s put a program in place.” If they are allowing direct access, but less than 3% of their population coming in via their route, what can be done in terms of marketing? There are a lot of things that individual PT can do above and beyond what’s happening at the state or federal level. Those are really the big things. I’ve never heard of a practice have a policy that says, “We do not do direct access.” That’s shocking to me. I’m glad that you brought that up because I don’t support that. I really think that as a profession, we should move toward direct access. In fact, I know a lot of practices that actually when you go to their website, somewhere on their website they’re educating patients that says that, “In this state, you have access to a physical therapist directly.” I think things like that are super, super important for a physical therapist to put on their website, to have in their clinic brochure, to put on your social media, your Facebook page. I think the more we can educate the public, the better it will be. Especially when I look at the rising costs of medical bills, of medical insurance in this country and the average patient has a deductible. Sometimes I’ve seen deductibles of $10,000 for family plans. They could spend thousands of dollars. I’ve seen this, they’ve gone through many physicians and practitioners before they get to PT, where in reality, they could’ve saw their PT first. Now, as doctoral trained professionals, we know that we can evaluate someone. If it’s outside of our scope, we’re going to refer them back to either their primary care physician or if it’s someone who fell on the street and they tore their ACL, obviously, they need an MRI and they need to be looked at by an orthopedic surgeon or another physician. I think there’s a great opportunity to forge relationships here that is missed. Education awareness; most hospital corporate administrators don’t know what direct access is. I agree with you. Education awareness, most hospital corporate administrators don’t know what direct access is. A lot of physicians don’t understand what direct access is. Again, when I was at University of Wisconsin Hospital and we started the program back in 2007, we developed an FAQ and we mailed it to patients that we had seen in the last three years and it was on the website. What does it mean? What does it mean related to your relationship with your primary care physician? Just try to spell that language out. Really, we’re changing a culture, is what we’re trying to do with this. One other thing, when I come back to the individual PT, I’m making an assumption that most physical therapists have health insurance. I wonder how many of us know whether our health plan allows for direct access to physical therapy services or not. We should be aware of that. That would be the item that dictates which insurance plan do I go with, but if I’m considering a plan that doesn’t allow direct access, I’m going to get on the phone as a consumer and talk about, “Why do you have this restriction?” If they hear from enough of the public, that’s also how health insurance policies can be altered. Years ago, I would not sign on to a policy because they only offered, I think it was four PT visits. They offered an eval and four PT visits. I was like, “Everything looks great. Your deductible is low and it covers some types of medications, but I can’t purchase a policy and give you money so to speak if you’re not supportive of my professional endeavors.” I think 99% of PTs are extremely altruistic and really are looking to help people with their health. They’re all important points. I’m glad we’re talking about direct access. I think right now in our profession, if you ask ten different physical therapists for their definition of PT and primary care, we’d get ten different definitions. I think direct access would be probably the core to all ten responses. It is not synonymous, the two are not synonymous. I think a majority of people agree that direct access to our services is part of a physical therapist’s role in a primary care setting within a primary care practice. I think it goes beyond that. It relates to primary prevention, secondary prevention or secondary and tertiary care are potential roles that physical therapists can have in this model. Health and wellness, prevention. Physical therapists have a role in that. You mentioned the military model early on and that is probably the model that most people are aware of that would equate to physical therapist in a primary care role. They’re triaging, then they’re managing and they’re directing care and pulling in a variety of practitioners based on the patient’s needs. That’s probably the model most people are familiar with. That’s tied to orthopedics, musculoskeletal system. Again, I think we can have a role beyond that patient population. It just hasn’t been as well explored or developed yet in these other areas. From your perspective, can you explain what you know about primary care in the military? What that looks like in the military? Are we talking about physical therapists on the battle line? Are we talking about physical therapists working maybe on the military base? What do you know about that? What does that look like exactly? Again, I’ve not been in the military so this is secondhand. I’ve interacted with a lot of military PTs and have read a lot of their literature, but it’s both. There are physical therapists that have been deployed in combat zones and then also in the public sector on military bases. The original model developed during the Vietnam war, where the orthopedic surgeon could not keep up with the triaging. Those people who needed surgery weren’t getting surgery in a timely fashion, so as the orthopods that brought PTs into the triaging role. When the war ended, that wasn’t automatically continued, but there’s a shortage of physicians, again peace time via the post Vietnam. They agree to pilot this model as the PT being the entry point, then doing the triaging and then the primary care role for a two-year model. Then the orthopedic surgeons had the ability to say, “Thumbs up, yes we’re going to do this. Thumbs down, we’re going to stop. Thumbs up, that pilot works so well. I’m more familiar with what happens in the military base here in the US for example. They’re an entry point to people with musculoskeletal complaints. The physical therapists who are in this role have gone through training above and beyond what their license allows and relates to referral for imaging, lab tests. Military PTs can restrict work or activities. There’s a set number of days that they can do that. They can prescribe certain medications as well within this role. There are papers they’ve published that patients have been safe, good decisions have been made. There are a lot of positives associated with that model. Springboarding off of that model from the military, where have we seen this start to take root in the public sector? There’s been less published, which is unfortunate to date. Anecdotally, I’ve heard of more and more physical therapists working in urgent care clinics, working in emergency departments, working in primary care centers. In some of these cases, the PT is not the entry point, solo entry point, they’re working side by side by a physician. There are other models where the PT is the entry point for certain complaints. The receptionist or a clinic manager is triaging phone calls. If it’s an ankle sprain, back pain, headache, maybe dizziness, they see the PT first. If it’s chest pain of course or things like that, they’re going to see the physician first. It’s happening more and more. You mentioned, going back to 2002, that’s where really things got on the books in terms of PT and primary care. I know out in the clinical world, there are more examples of PTs working in these settings. The roles are gradually expanding beyond for example what’s happening in the military. A couple of weeks ago, I spoke at the PT NEXT Conference and there was actually a lecture there on primary care and PT. I’m just curious to know, what was the outcome from that lecture or what’s the feedback and then what’s the APTA doing as far as taking steps toward primary care in the various settings that exist? There’s nothing formally in education in our professional programs, we don’t have a specialty area in primary care. Based on House of Delegate activity, I think it was 2014, maybe 2015, APTA was charged to investigate roles, current status basically of PT and primary care both from a practice and educational research perspective. We put together a staff work group to dig into this area, look at the literature, contact people who are in this role. Surprisingly, what they found was it was all over the map. There’s nothing formally in education in our professional programs, we don’t have a specialty area in primary care, elements of primary care are being taught something within the DPT programs these days, but it’s not under primary care per se. What the board decides to do as a next step is, we hire a consultant and she’s putting together a group to do a Delphi study, a feasibility study related to PT practice and primary care should be an area of specialty. There’s a formal process that we’ve done in orthopedics and neuro and peds and geriatrics that have led to a specialty certification exam for clinicians, potentially residencies and fellowships. This has not been done before in the past where we’re fond of looking at, “Should this be an area of specialty practice within our profession?” That group has just been formulated. The target is to have their work done, these feasibilities done by the end of the year or very early 2018. It sounds super exciting. Also it sounds like a big project as well. It is. It’s a daunting task. In some ways, it’s easier with an area like peds or geriatrics or ortho. How do we define primary care? You’d think elements of all the other specialty areas and part of our generalist approach. It’s going to be a challenge for this group. I have so many questions that piggyback off that. First, I guess from an educational perspective, do we need a primary care course in our DPT education? That’s one of the questions to ask. There really isn’t at this stage that I’m aware of. It’s like a question, “Do we need a pediatric course? Do we need a musculoskeletal course?” The answer is yes, we have course in both. 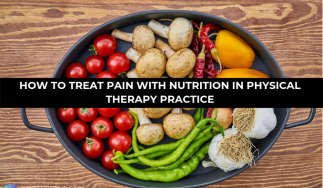 My question is, for instance, if you look at most DPT programs, there’s not a specific course on pain, but there are aspects of obviously pain and pain management loop through many classes. I guess, maybe as part of the study, would they look at DPT education and figure out are there primary care skills being taught throughout the two to three-year education process that’s not necessarily specific course? They’ll be looking more at current practice in therapists who are in primary care settings or providing part of a primary care model. What are the elements of their practice? Try to put that together, take all these pieces of the puzzle and put the puzzle together, then we can go and look at, what’s being taught in our education programs? Is this a post professional area of specialty? The foundations are going to get in the DPT program like they do in ortho and peds but to become a specialist in that area, there’s additional training. Our concept of the generalist, is that the framework for a primary care physician therapist or who goes on and does some additional training? We don’t know those answers yet. I think the step that the board of directors decided to take used a logical next step. Then from there, we can walk back to our DPT programs and then walk forth into our specialty areas. If I would take this conversation full circle, I would say, does achieving primary care squash or make the direct access argument and challenges any easier? I don’t think it does either. Again, I think direct access is not synonymous with primary care. The roles that a physical therapist can have, in the realm of primary care, is very extensive. They have not been fully developed in most areas outside of the classic military MSK model. I don’t think it necessarily will do either. I think we need to continue to pursue the direct access and remove the limitations and restrictions. We need to implement it more in day-to-day practice. That will open doors for us I think in this primary care arena. To answer your question, I don’t think it will necessarily directly squash or necessarily enhance either. We have some data, I think especially now when we start to talk about the opioid epidemic that as a primary care provider, as a physician, some physicians have chosen opioids first and they’re not really well-versed on the alternatives. 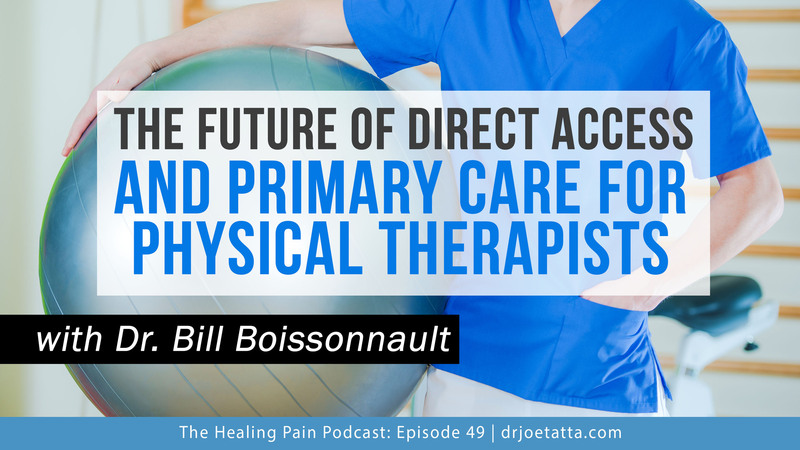 I don’t want to say physical therapy is an alternative model of care because it’s really not. We’re really in more of the traditional aspect of healthcare. A lot of primary care physicians still really have yet to learn what a physical therapist is and the role they play. I wonder how the average primary care physician looks at primary care PT and how do we forge a better relationship with the primary care doctors? When I speak to primary care physicians in their office, they’re extremely overwhelmed. I think in a lot of ways, they would actually like someone to take the pressure off them to help the patients they have come into their office and most of them are seeing one patient every eight to ten minutes. Helping their patients is becoming a challenge. How do we talk to primary care physicians directly about collaboration? We can help take load off medical doctors by assuming this role, but now we have to get in this role. A couple of things, you’re playing above the physicians and their schedules being overwhelmed. That has opened doors for physical therapists to assume this role of the entry point. That’s what happened in the military. You mentioned Kaiser, that’s what happened in Kaiser in the mid and late 1990s. At the University of Wisconsin Hospital, our department chair, an orthopedic spine surgeon, his first response when we presented our proposal was, “Why haven’t we done this before?” Honestly, his schedule was filled with non surgical patients. He said, “I don’t need to see these people. You need to see these people. You’ll send me the surgical canvass.” We can help take load off medical doctors by assuming this role, but now we have to get in this role. In terms of physician knowledge of what the physical therapists can do, it is very limited. I used to do a lecture, this is part of a Q&A at NEXT that just took place in Boston, how to increase physician awareness. The best way is through collaborative patient care, but it takes an effort on our part to communicate with physicians and nurse practitioners, but over a patient I have found is the best way. That includes, and again this is not in all settings, but rounds, physical therapists attending rounds with physicians, participating in a discussion about management of different patient types, of different patient categories. That’s when they started developing appreciation for what skill set do we bring to the table and how our skills complement their skills and their scope. Doing a lecture, doing an in-service is better than nothing. I just remember I had opportunities at the medical school back at Wisconsin to give a one-hour lecture on the physical therapy profession to med students and residents. It wasn’t until I switched from the lecture to examining one of the students who had a back problem in front of the group, that’s when I had their attention. This communication gap, of course they have some responsibility, but we’re the ones that have to take the most steps to connect. I think through patient care is the most effective way that I have found. My final question for the podcast today would be, I’ve watched the nurse practitioner evolution occur. I think it’s an interesting model for PTs to look at because I think in some ways we’re paralleling what they’ve done. My mom is a registered nurse. Years ago, she got her first nursing degree. She had an Associate’s in Nursing, then eventually, she went on for her Bachelor’s in Nursing. Nowadays, people can go on for their MP, which is in total, it’s about a six-year degree, which physical therapy is six plus, it’s seven or even eight in some instances. Is there something for us to learn from a nurse practitioner evolution and might they be an ally for us? Yeah, very much so. There are a lot of parallels. When we’ve evolved to the DPT, another parallel we learn from was the pharmacist, with the Pharm D. We can certainly learn from the nurse practitioners and the role that they’ve taken. They’ve had a lot of the same obstacles and pushback as we have had related to direct access. That’s a group that we can potentially partner with, clinically, from an advocacy standpoint. I don’t want this to be us versus the physicians, that doesn’t do us any good at all and that cannot carry over to patient care being the delivered. We can learn from others that have gone through some of our steps and face similar challenges. 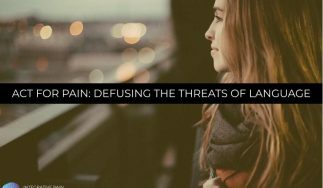 I want to thank Dr. Bill Boissonnault for being on the Healing Pain Podcast this week. He’s the Executive Vice President of Professional Affairs for the American Physical Therapy Association. Bill, where can people find more information out about you? Two things, going back to our conversation about direct access, APTA.org, under Advocacy and then you click on State Government Affairs. It has a lot of information related to direct access, imaging, many of the topics related to what we discussed today. There’s a wealth of information. That’s a good place for people to start. There are also some articles relevant to this topic. Contacting me directly probably is best just through APTA.org. Again, going to the information that’s listed there, that would be the best way to contact us. If people look at our resources not finding what they need, is to let us know and we’ll help provide answers for them. I want to thank everyone for joining me this week on the Healing Pain Podcast. Of course, if you’re a physical therapist or other health care practitioner and find the state of direct access and primary care important, please make sure to share this podcast out with all of your professional colleagues. If you’re a patient or someone who is interested in having access to physical therapy in a way that’s easier, we can get the care and support you need for obviously, your chronic pain or your chronic disease. You can share this as well with your friends and family and you could also share it with your senator or congressmen or anyone in your state because it’s really great information. Stay tuned to next week’s episode of the Healing Pain Podcast. We’ll see you next week. Bill Boissonnault, PT, DPT, DHSc, FAPTA, is executive vice president of Professional Affairs, APTA. Until recently, he was a professor at the University of Wisconsin-Madison and senior physical therapist at the University of Wisconsin Hospital/Clinics. He earned a bachelor’s degree in physical therapy from the University of Wisconsin-Madison; master’s degree and doctor of health sciences degree from the University of St Augustine; and a doctor of physical therapy degree from the Institute of Health Professions-Massachusetts General Hospital. He is a Fellow of the American Academy of Orthopedic Manual Physical Therapists. He has published numerous articles related to patient direct access to physical therapist services model, consulted with more than 70 hospitals and clinics regarding implementation of the direct access model, and served on the Wisconsin Physical Therapy Association’s task force for promoting the adoption of the direct access model.